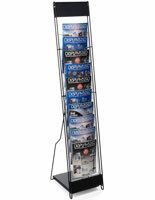 This folding banner stand for trade shows features a glossy silver finish that looks great on a showroom floor, too. 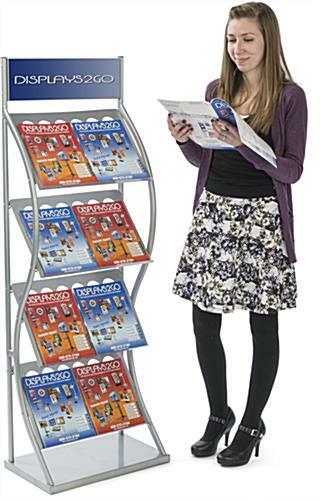 Easy to assemble, this sign holder will display messaging and advertisements that boost sales for your business. 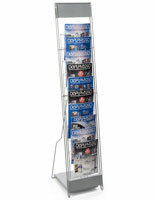 Place this banner stand, also known as a trade shows display, on a convention center floor, and move it to another venue later - it’s only 14 lbs.! 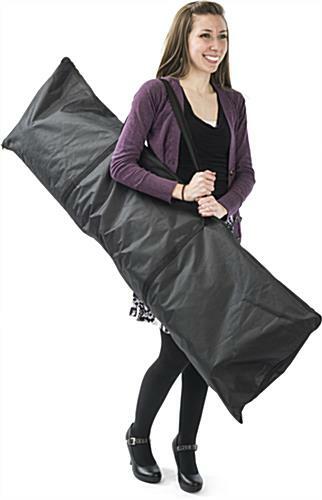 Transportation of this sign holder is a breeze, thanks to the enclosed carrybag. 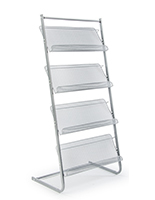 This steel display is sturdy, with a unique design. 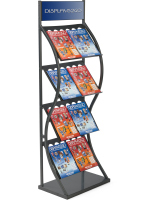 Buy this stand for an exhibit with double-wide pockets that store newsletters, catalogs, and magazines on each of (4) shelves. A 17.5w header can be seen from across a hotel lobby so passersby won’t miss out on an opportunity to purchase wares and services.